Scientists will detonate a "Big Bang" explosion on a Chile mountaintop today to start construction on a major new telescope and Internet denizens around the world can watch the action live online. Backers of the Giant Magellan Telescope, a huge 82-foot (24.5-meter) observatory that promises to outdo the Hubble Space Telescope several times over, will broadcast the first excavation blast from a mountain in Chile's high Atacama Desert live at 12 p.m. EDT (1600 GMT). "On Friday, March 23, the First Blast (Big Bang Event) is scheduled to occur at Las Campanas Peak in Chile, at high noon US Eastern Daylight Time," telescope project officials said in an announcement. "This marks the beginning of leveling and site preparation prior to construction of the Giant Magellan Telescope." Viewers must "Enter as a Guest" and type a name to login in order to view the blast, project officials said. The Giant Magellan Telescope is one of several huge ground-based telescopes currently under way at various locations around the world. The project aims to build a $700 million telescope made up of six circular mirrors, each 28 feet (8.4 meters) across, which can be adjusted to eliminate the blurring effects of Earth's atmosphere. The telescope is being built by 10 different university and organizations spread across Australia, South Korea and the United States. It is expected to be completed in 2018. 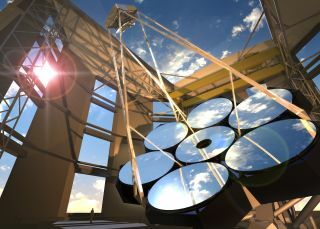 An artist's illustration of the completed Giant Magellan Telescope atop Las Campanas Peak in Chile's Atacama Desert. The 82-foot (24.5-meter) telescope will be one of the largest on Earth when it is completed in 2018. The Giant Magellan Telescope won't be the world's largest telescope (the planned 138-foot (42-meter) European Extremely Large Telescope has that honor and also begins construction this year), but it should have 10 times the resolution of the Hubble Space Telescope, project officials said. Researchers hope the new telescope will be able to shed new light on how the first galaxies formed, the true nature of dark matter and dark energy, and other ongoing astronomical mysteries. The new telescope's location at an altitude of 8,500 feet (2,550 meters) up in Chile's Atacama Desert is also an optimum base for deep-sky surveys. The region can have dark, clear skies 300 nights a year and is currently home to many telescopes operated by the European Southern Observatory. The desert is also the future home of the European Extremely Large Telescope.